Conference time is looming, Christmas is coming, or may be you simply need to brief your staff. So why don’t you make use of our live streaming offer. We have it all covered and can get your crucial messages to anywhere around the globe via the web. If you can’t get there, then say it personally with you very own webinar. We provide everything you will need for your event broadcast. This package includes one of our outside broadcast trucks for one day. It comes with three crew members, a vision mixing director, a cameraman and a technical engineer. Included are three cameras, two fixed and one will be manned, together with all the other bits of equipment. 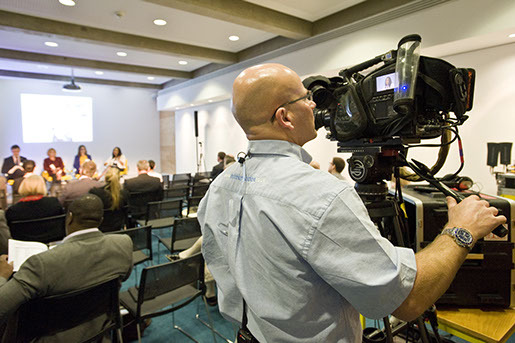 We will broadcast your event via social media or a private link for up to four hours in any one day. All you have to do is order and pay for the package in October 2017. This normally retails for £1800 +VAT. We are discounting it to £1500 +VAT to celebrate the launch of our new website features. The small print: This offer is based on a UK transmission point and includes 150 miles of travel from our Midlands base. Call times prior to 0900 and more than 2 hrs from this point will be charged an overnight fee for the crew members prior to transmission. Cost is for a 10hr period and excludes the following: data costs and additional extras, micro sites, pre-event filming, post production or presenters.